�Aging should not be regarded as an affliction. It is a stage in life, like all others, that deserves to be celebrated and documented in all its natural grace and beauty.� -Chest Higgins Jr.
Gerontology is the study of the social, cultural, psychological, cognitive, and biological aspects of aging population. 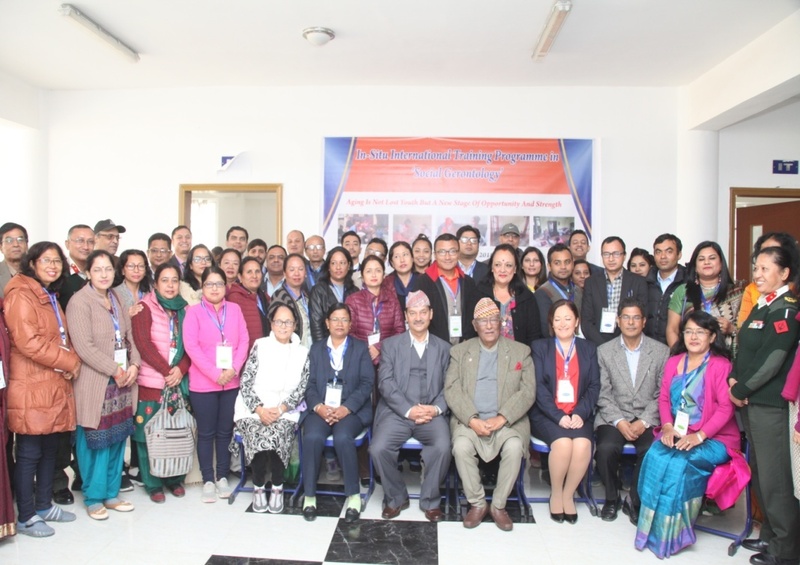 This multi-disciplinary training programme in Social Gerontology was jointly designed and executed by close collaboration between International Expert Group from International Institute on Aging (INIA), United Nations-Malta, Nepalese Army Institute of Health Sciences (NAIHS), National Senior Citizens Federation (NSCF), Nepal and Department of Health Services (DoHS), Nepal. It aimed to provide a broad and up-to-date understanding of the complex and far-reaching consequences, challenges and measure to handle in relation to population ageing brought in by the longevity revolution. �Increase understanding of the different issues confronting aging populations and commonly used terms, conceptual frameworks, and domains of gerontology study. �Comprehend the social, psychological, and biological theories that are applied within the field of gerontology, examining both normal and abnormal age-related changes that occur throughout the lifespan and their impact on practice. �Foster knowledge of constructive interdisciplinary practice for improving the quality of services and supports for aging populations. �Provide different professionals with skills for evaluating the issues and services for an aging population. 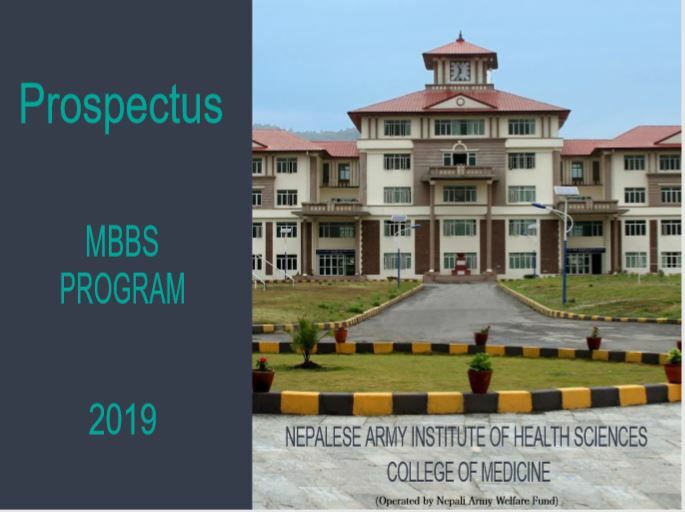 Date: November 20 to November 23, 2018 A.D.
Venue: 1st floor Auditorium Complex, of NAIHS, Sanobharyang, Kathmandu, Nepal. �Maj. Gen. Prof. DrBachhu Ram K.C. (Rtd), Executive Director of NAIHS. �Col.Dr. SudhaSen Mall, Pricipal of NAIHS-College of Polytechnic. �Head of Departments� of Anatomy, Biochemistry, Pharmacology, Physiology, Pathology and Microbiology Departments, NAIHS-COM. �Other Dignitaries from NAIHS family. The inauguration ceremony was covered by news teams from Image Channel and Mountain TV Nepal which captured and aired on national television of Nepal. The Master of the ceremony, Maj. Dr. Lee Budhathoki, formally opened the training with a welcome speech by Prof Dr. LochanaShrestha who introduced the training and highlighted the areas that the training would touch. 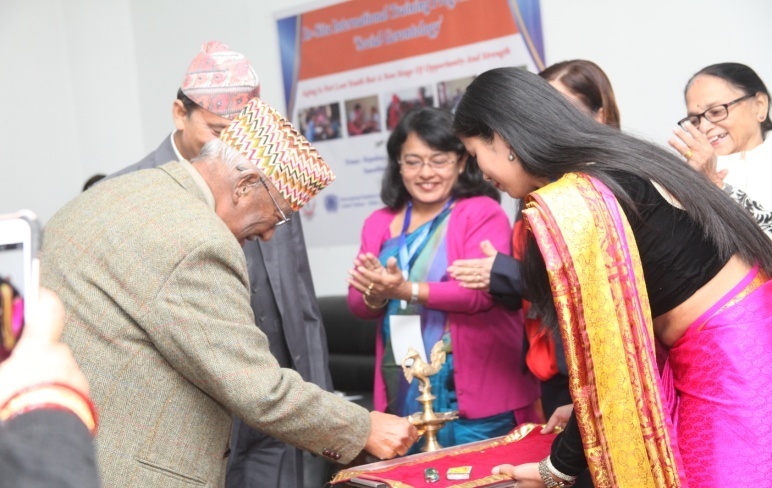 Chief Guest General ArjunNarsinghRana (Rtd) stated pleasure to be in premises of institute established by efforts of Nepalese Army and felt honored to be included as chief guest in program that deals with Social Gerontology, a promising field dealing with a rising issue of aging population all over the world. He felt such programs were necessary to be conducted and hoped for more programs in this field in the future. This was followed remarks from Maj. Gen. Prof. Dr. Bachhu Ram K.C. (Rtd), RoshaniTuitui, Ms. Rosette Farrugia-Bonello and Mrs. Ambika K.C and Inauguration ceremony was concluded by a short Commencement of Program with ceremonial light by Maj. Gen. Prof. DrBachhu Ram K.C. (Rtd), NAIHS and Ms. Rosette Farrugia-Bonello which denoted the start of the training program. 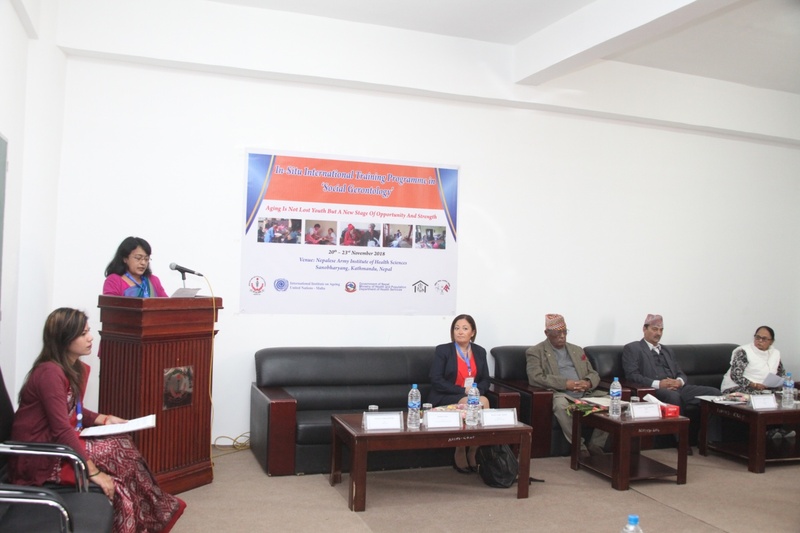 A total of 36 participants were involved in this program who are National and international social workers, academicians, health professionals from different fields related to health: included medical doctors, professors from Universities, health professionals working in Government and non-government Hospitals of all regions of Nepal. The program was conducted over 4 days during which various topics were covered via Interactive Lectures from the resource persons.. In addition to interactive lectures, a visit to Health Home Care Nepal Pvt. Ltd, Sanepa was done for a brief demonstration of principles of elder care in actual practice. A group activity was also organized where participants were divided into various groups and were encouraged to discuss and present on current status of elderly and how they could help at Individual, Family, Community and Policy level in national and international scenarios with feedback from resource persons. At the end of the program, all scheduled activities were successfully completed. �Brig. Gen. Dr. Nagendra K.C., Principal of NAIHS-COM. 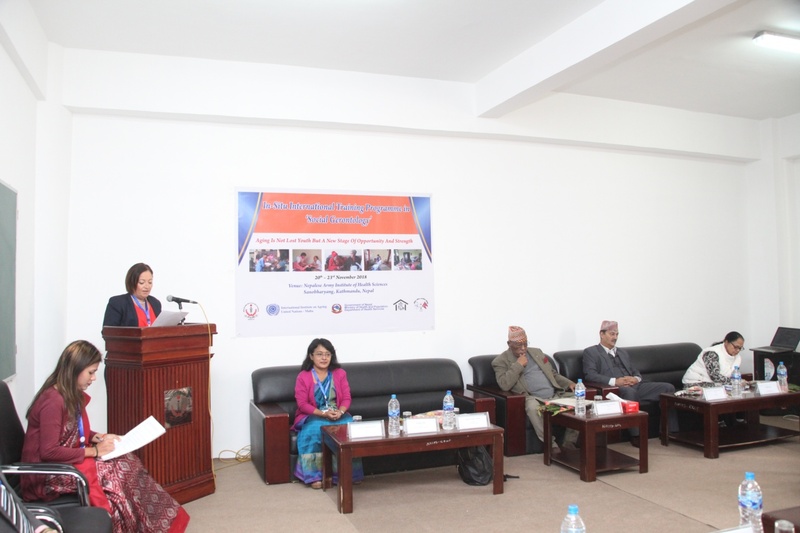 As voice of the participants, Lt. Col. Dr. Ajay Rajbhandari and FrediaBokali P. Engheepi expressed their appreciation and gratitude to be on the program and Dr. Nidhi Gupta also stated her happiness to be involved in the collaborative effort on Gerontology in NAIHS grounds and showed her appreciation for the enthusiasm and willingness of participants to learn in the training. Brig. 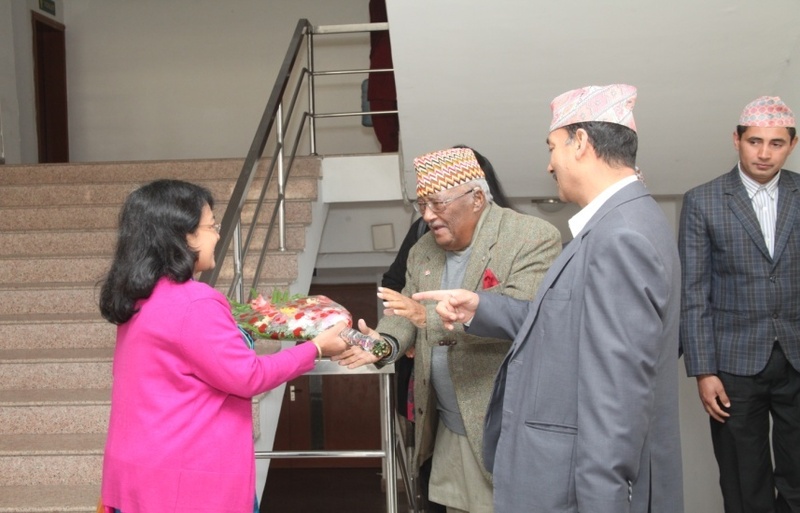 Gen. Prof. Dr. Bhairab Kumar Hamal (Rtd) congratulated the organizing committee for the successful execution of the program and the participants for successfully completing the program. He was happy that the subject of Elderly Care was receiving proper attention on individual, family, community and policy level in both national and international setting and he is looking forward to future collaboration in similar programs in the field of Gerontology. 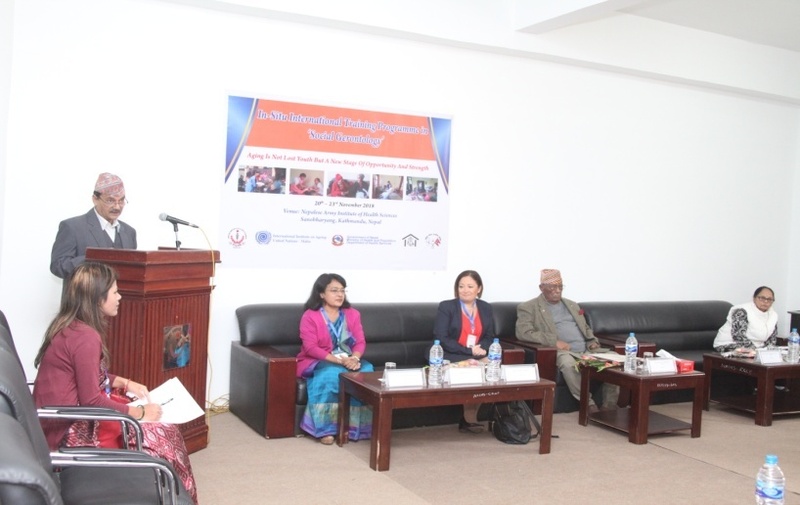 It was followed by closing statements from Prof. Dr. LochanaShrestha who thanked the attendees for their presence, Rosette Farrugia-Bonello, Dr. Shiromi M. De. S. Maduwage and Dr. Nidhi Gupta for their cooperation in making the program possible, resource persons for contributing to the program, and thanked INIA, NSCF, WHO, NAIHS family and Government for their endearing support and the participants for their enthusiasm and willingness to learn in the field of Gerontology. She was hopeful for future efforts in the field of gerontology. The program was properly concluded by distribution of Certificates of Completion was done to Resource Persons and Participants by Brig. Gen. Prof. Dr. Bhairab Kumar Hamal (Rtd) and Brig. Gen. Dr. Nagendra K.C. 1. National and International Social and Health Professionals of government and non government sectors motivated and skilled to enhance the activities to address the issues and problems of aging population which is the forth coming global problem in world. 2.These professionals were overwhelmed with different measures to address the aging population and committed to support to frame the guidelines and activities related to aging population of Government. 3. 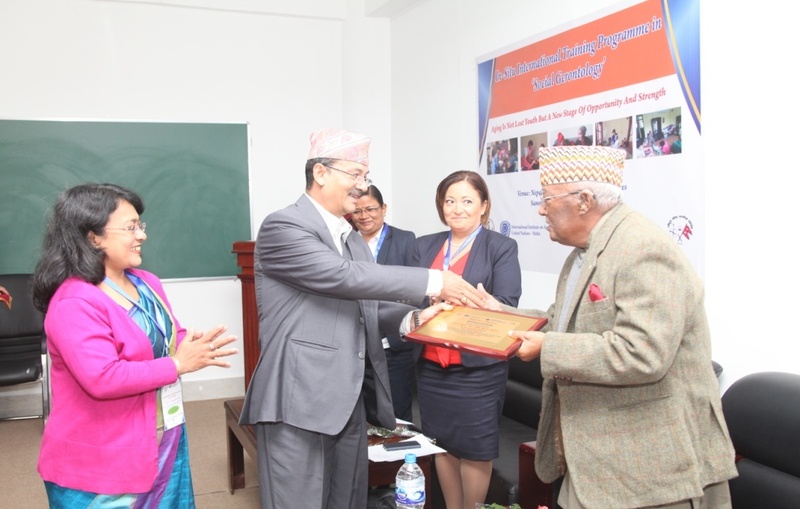 Government showed the interest for further human capacity development and committed to develop collaboration with different sectors working in this area to address aging population in Nepal.